By means unknown, the original stone was removed at an early date, presumably by those who had erected it, and was replaced by another similar stone on which were scratched the names of early surveyors and the date “1768.” In his deed to a lot near 2nd and Allegheny Streets, the founder of Huntingdon, William Smith, refers to it as the “Ancient Stone lot,” which seems to indicate that the original stone had stood somewhere on that lot. Today the location is separated from the junction of the creek and river by the railroad grade and tracks, but before the railroad existed, the lot would have extended to the riverbank and would have been within sight of where the two streams join. In time, the second Standing Stone was removed from the “Ancient Stone lot” to the yard of a stone house still in existence at 105 William Smith Street — a house owned at the time by descendents of William Smith. Despite it’s being very dense and resistant to breaking; the stone was broken into several pieces by “malicious” persons, according to a contemporary report. One fragment of that stone survives and is displayed in the main corridor of the Huntingdon County Courthouse. The names and date scratched into it so long ago can still be seen on its smooth dark gray surface. 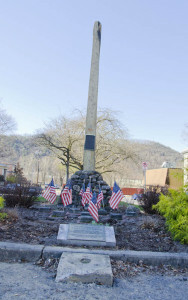 In 1896, as the Borough of Huntingdon was preparing to celebrate the centennial anniversary of its incorporation, local industrialist J.C. Blair suggested that a stone shaft be erected to commemorate the original name by which the town was known. The present stone at Penn & William Smith Streets was dedicated in September 1896 and has stood since then as a reminder of Huntingdon’s long history as a place of importance in Central Pennsylvania. The town of Huntingdon, described in early deeds as being “at Standing Stone on Juniata,” was laid out in 1767, only thirteen years after this region of Pennsylvania was purchased from the Indians. The Rev. William Smith, head of the College of Philadelphia (now University of Pennsylvania) and an energetic speculator in frontier lands, was the town founder and proprietor. To ensure the development of his town. Smith’s deeds required lot owners to erect a substantial house within a year or so of purchase. Nevertheless, growth was slow because of unsettled conditions in this frontier region during the Revolution. But settlers poured into the area during the 1780s, and in 1787, Huntingdon was made the seat of a new county, named for the already thriving town. A pleased Dr. Smith joined local citizens in contributing funds to build a county courthouse. Many of the houses built during the town’s earliest period of development were log, with a scattering of brick and stone structures. A few of these 18th and earliest 19th century buildings survive along Perm Street between Second and Sixth, combined with a number of handsome brick residences built in the mid-19th century by the town’s increasingly prosperous citizens. 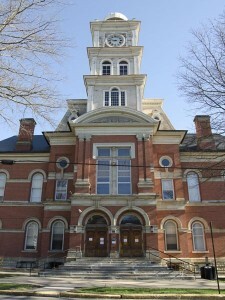 Also erected during this second stage of the town’s development was the county’s second courthouse, which from 1842 to 1883 occupied the same plot of ground on which the present courthouse was later constructed. Despite Huntingdon’s very early founding, and the survival of representative buildings from its first century of development, the majority of outstanding buildings which line Huntingdon’s downtown streets today document a later period of expansion and development which occurred between the Civil War and World War I. During this extended period, many of the ancient borough’s original buildings were replaced by the larger and more substantial structures now seen along its streets. They signify a new social and economic structure, made possible by efficient railroad transportation, which saw Huntingdon transformed from a town of less than 1500 residents in 1850 to double that population (3034) in 1870 and to more than 6000 citizens in 1900. The difference was industry, particularly manufacturing, which blossomed along the railroad, providing scores of jobs and fueling a building boom of major proportions. The workers attracted to Huntingdon’s new factories, which manufactured everything from paper tablets to railroad cars, provoked a rash of house building, particularly in the rapidly developing West End. The town fathers organized a Board of Trade to attract development. Two of their projects have had significant long-term effects on the town: promoting the expansion of Juniata College on a West End hill-top site and securing the development of a large State prison on a site just across the river in Smithfield. A distinction began to arise in Huntingdon between its residential and commercial sections, and a “downtown” developed, where retail business was centered. The expanding population needed stoves and furniture, clothing and shoes, drugs, hardware, and coal. They required banks, schools, a bigger post office, newspapers, telephones, and electric lights. And restaurants, hotels, boarding houses, pool halls, lodge rooms, and theatres. In the half century between 1865 and 1915 more than fifty large commercial buildings – an average of one a year – went up in downtown Huntingdon. Nothing remotely approaching such a boom has occurred in the same area since then. A majority of those stylish structures survive today, many of them newly refurbished in cooperation with Huntingdon’s on-going Main Street program, founded. 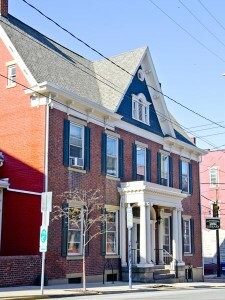 For example, the Huntingdon County Library is housed in the former McMurtrie Estate located on the corner 4th & Penn Streets.